Multi-CB is proud to be a leading partner in the field of printed circuit board manufacturing. Our technical know-how and experienced CAM station engineers regarding PCB manufacturing make our special performance. On request we produce for you custom PCBs with 1-48 layers that meet the highest technical requirements. Multi-CB can draw on many years of experience in the production of PCBs. Moreover, we convince through superior service. Customers benefit from low prices, expert advice and a flexible delivery service. PCBs can be found today in virtually all electrical appliances such as TVs, radios, computers. Multi-CB produces not only the desired printed circuit boards, but also includes tooling testing. For this, Multi-CB standardly performs a design rule check, in which the production data of the customers are carefully examined for their producibilityright before the printed circuit board production. 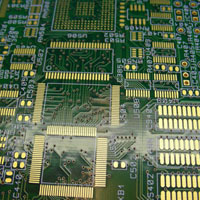 Interested in custom printed circuit boards from our company? Direct here on the Internet, you can configure and order your specific PCB. Thanks to the various technical options even complicated problems can be given an optimal solution. E.g. for particularly difficult space conditions, Multi-CB can offer a Rigid-flex circuit board. In this case, rigid and flexible PCB parts are adapted to the space and fixed to each other. Besides standard PCBs and special circuit boards can be produced as a prototype or series. Thanks to fair graduated prices and an additional on-line discount of 5% this PCBs are particularly favorable. Multi-CB - "High Tech at low cost". Your order is usually sent within a few days to you. In addition, our customers have the opportunity to take our 48-hour express service. The competent service, quality products and unbeatable prices make Multi-CB to one of the leading suppliers in the field of printed circuit board manufacturing.